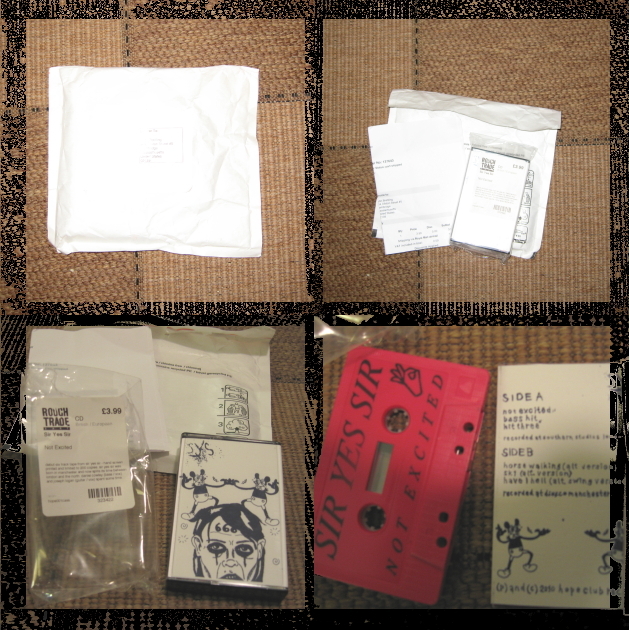 London-based (via Manchester) noise-pop sensations Sir Yes Sir's thrilling cassette-only debut EP Not Excited arrived today. The collection was released March 1 in the UK and remains available for purchase -- until the limited edition of 200 copies peters out -- from Rough Trade here. We first wrote about Sir Yes Sir right here in January; since then the band has shared the stage with Clicky Clicky faves Johnny Foreigner; released said EP; played the big Pavement tribute show in Brixton earlier this month; and recorded a radio session with Huw Stephens. Late word from the band is that it will appear on a forthcoming compilation put out by London-based indie concern Fierce Panda. Fierce Panda will release June 14 the Licensed To Drill six-track compilation EP, to which Sir Yes Sir have contributed the song "Your Recent Hits." Apparently a Sir Yes Sir full-length recording is in the works. These are exciting times.